Behaviors stemming from Alzheimer’s disease or other dementias like Frototemporal dementia might mean placement in a traditional assisted living facility will be difficult, if not impossible. And even those facilities that claim to deal with dementia or Alzheimer’s-related behaviors don’t. At least that’s been my experience. Since 2009, my mother has been asked to leave two assisted living facilities and one group home — all of which were licensed to deal with dementia/Alzheimer’s patients (one place boasted about the specialized dementia training they gave their caregivers) and, in theory, her behaviors — and spent time at two geriatric psychiatric hospitals, where she was “stabilized” with drugs including, lithium, depakote, zyprexa, and the list — quite literally — goes on. One doctor even wanted to perform electroshock therapy, claiming her behaviors were the result of bipolar disorder (she was in her early 70s at the time and had never exhibited bipolar behavior). Being asked to leave a facility was, by far, one of the most stressful, awful, even embarrassing experiences of my life… How could this have happened? Where are we going to go? What do I do? Did this really have to happen on a Friday? Unfortunately, one of the lessons I’ve learned over the years is that somehow, you must stay one step ahead of the disease. I confess, despite knowing this, I’ve failed miserably. I can’t keep up with it. It jumps around, it’s quick… it’s unpredictable. Ask me if I feel like I’ve made my mom’s life better and I’ll tell you no… but I did the best I could with the knowledge I had at the time. Describe how you will get to know (name). What is your policy on personalizing daily routines? Can (name) sleep when they want or need to? Can s/he eat when hungry? What is your staff-to-person ratio, and what is the average length of employment for staff members, overall? What is your policy for communicating with (name’s) decision maker? How will your organization honor (name) wishes for spirituality and end-of-life? Since 90 percent of people with dementia experience changes in personality and behavior, how does your organization address challenging dementia-related behavior? “If the answer is, ‘We use medications or we discharge them to the hospital,’ RUN,” says Tena. She says, “this basic method for addressing dementia-related behavior separates the organizations that provide quality dementia care and service and those that don’t.”Of course, at the end of the day, according to Tena, the best advice is to choose an organization well in advance of when the person needs it. Good timing for me, thanks for these questions. Very overwhelming. Great post. 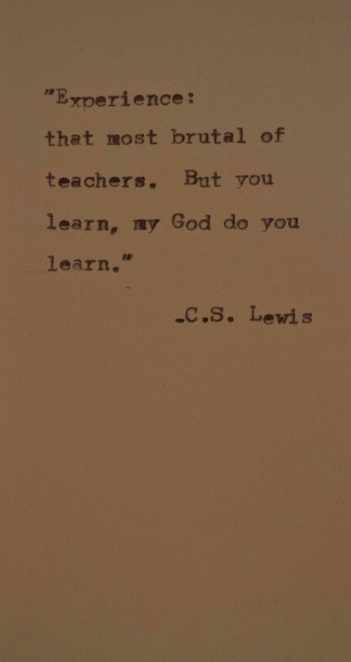 Great quote from C.S. Lewis. Every caregiver receives an education like they never imagined. The questions to ask when choosing a facility are excellent. My dad had Alzheimer’s and was in a dementia ward. He liked to sleep during the day and wander around at night. He was allowed to do this, but because they lacked in staffing, that’s when Dad had most of his falls. The facility my dad was in definitely doped up their patients. I will never know what stole my dad’s personality first–the disease or the drugs. Know what you mean. Mom was in a rehab at the same facility as her assisted living and at a meeting on Thursday they told me she couldn’t go back to assisted liing but must go to a nursing home. I really think they thought I’d choose them, but the rehab had been a nightmare experience and the nursing home was just across the nurses station and appeared to be the same way. The Monday they were going to discharge her was a holiday, so I had to get out that Friday and look at everything available. You know as well as me they don’t take them until they test and interview them, so it would have been impossible to place her by Monday. So I got down on my needs and begged the assisted living nurse to try her for one week. That bought me the week I needed to make a choice, get the interview and tests done, and then moved the next week to a nursing home that has their own dementia hallway with only trained nurses and aides. After another fall I tried the “normal” hall and in 3 days could see the difference in training and handling given to the dementia caregivers, and she’s been there now 9 months. They tell me she can stay there even through hospice as they have a hospice wing, so hopefully no more moves. 4 in one year was enough for me. At Mom’s nursing home, no meds are given without my prior approval.